I love cats and I have the BEST cat right now! Jesse is a lovey-dovey, canine type of cat. He sits with us, wants to always be in a room with someone (except my 3 year old Spencer because Jesse is UNDERSTANDABLY scared of him!) and will rub his big ole head against you until you are covered in fur and drool-EWW but sweet! No aloofness for him! 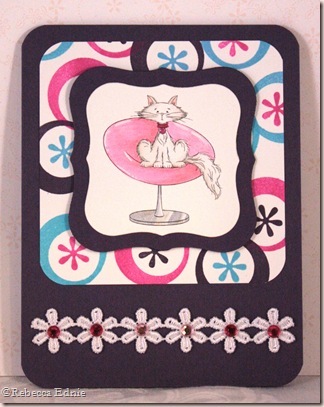 So I was thrilled to see a kitty in the releases this month from Doodle Pantry! This chair reminded me of one I’ve seen with glitter right in the vinyl. Kind of like the turquoise glitter vinyl found covering those wonderful counter stools in 50’s diners! So I tried to colour the seat so it would look like shiny plastic and the base so it would look like shiny metal. Not perfect, but I think you get the idea. I used a blossom Spica pen for the glitter. The background paper was made using a retro shape set I’ve had for soooo long! It was great to break it out and really have fun with it. I made a bigger sheet but it was too overwhelming for kitty so it got trimmed down a couple of times. Kitty is blinged too. Well sort of. I added a Tiny Twinkle to her collar then decided to cut the image out with my Labels 1 Nesties. Ooops, yep, you guessed it, the rhinestone was smashed! Funny thing though, all of the pieces stayed in place and it does look kinda cool so I left it as is. I just love what you did with this image. So darn cute!